The panel, which according to the historian Elias Ashmole had been originally carved by Henry Carrant in 1558, has been renewed more than once since Willement described it in the early 19th century. Following the outline of the original, the coat of arms has been resculpted, displaying the Hapsburg arms of Philip II on one side (dexter) of the shield side-by-side (impaled) with the royal arms of Mary as Queen of England on the other side (sinister), with the eagle and pomegranates representing Spain and the lion and rose branch symbolising England. Mary’s motto, carved at the bottom of the panel, means ‘Truth, the daughter of Time’. 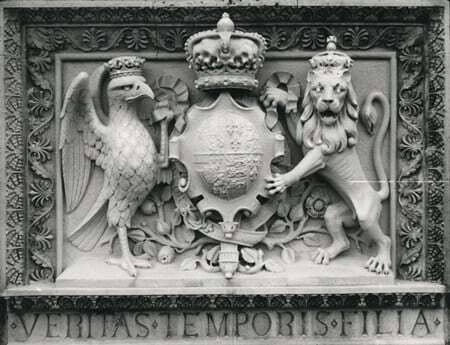 In 1952 our present Queen authorised the renaming of the Governor of the Military Knights’ house as Mary Tudor Tower; this photograph of the arms appearing in the Annual Report of The Society of Friends of St George’s and the Descendants of the Knights of the Garter for 1952 to mark the occasion. Originally constructed by Edward III in 1360 to act as a bell tower for St George’s Chapel, it was converted into a residence for the Governor of the Poor Knights under Mary I. For many years it was known as Governor’s Tower, but this caused confusion because its name implied that it was inhabited by the Governor of the Castle (a separate office), whose residence was elsewhere in the Castle. For sixty years it has been known as Mary Tudor Tower after the Tudor Queen who refashioned it in the 16th century. It will shortly to be occupied by the new Governor of the Military Knights, Lieutenant General Peter Pearson, who takes up his appointment on 1 August.